Kanatsiohareke is a sustainable, living Onkwehon:we community grounded in Rotinonhsionni culture - its language, land, and social structure. We want to send out a special thank you to all of our friends and supporters! It is because of YOU that Kanatsiohareke is moving closer towards its long term goal of building a sustainable, self-sufficient community focused on the revitalization and maintenance of Mohawk Language and cultural traditions. It is also because of your generous support that we have finally been able to get started on our pavilion project AND get working on our much more important Clean Water Project! In 2018 we hope to finish the pavilion, finish the first stage of the Clean Water Project, make some movement on the second stage of our Clean Water Project, and possibly begin working on sustainable/renewable energy systems, along with other needed infrastructure work. We are wishing you all much health and happiness in 2018. We also hope to share our clean, potable water with you under the roof of our new pavilion in the coming year! "Today we have gathered and we see that the cycles of life continue. We have been given the duty to live in balance and harmony with each other and all living things. So now, we bring our minds together as one as we give greetings and thanks to each other as People." In a previous Communicator I told about stopping at a Mohawk bed and breakfast/craft store on Rt. 5 returning from a trip to Albany. 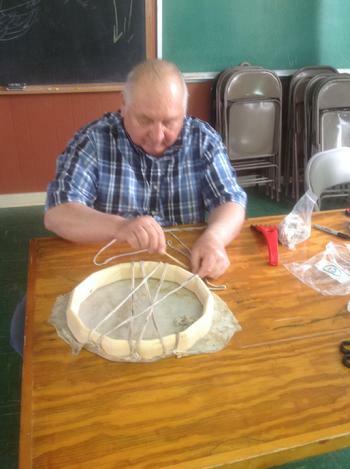 Aug. 13 Doug and I returned there to attend a presentation by Darren Bonaparte on "Wampum". Before I came to Phoenix, the vast amount of my career was in adult education at Hutchings. I say that because I have been in numerous presentations. Darren Bonaparte’s presentation was nothing short of excellent. I will never be able to think of Wampum as "Indian Money" again. I knew nothing on the subject before; I know a lot more now, but not all. Wampum Belts are sacred objects that Native American Indians use to tell their history and convey who they are as people. Darren’s presentation was about 4 hours, from 10 to 3 with lunch in-between. How could anyone make 4 hours of talking about beads interesting let alone meaningful? He did. The presentation cost was $25 which included lunch – which was also excellent. It was well worth it. Our purpose in going was to "check this place out"; could we recommend it to others. Well, we’re in love with it; I have to work on being able to say the name of the place right, but it is great. In 1993, a small group of traditional Mohawk people returned to the homeland of their ancestors and re-established a Mohawk community called Kanatsiohareke (pronounced Gah Nah Jo Hah Leh: Geh). It’s on the north shore of the Mohawk River between Fonda and Palatine Bridge. It is on about 400 acres of land that they purchased at public auction which was originally the site of the Bear Clan of the Mohawk People. Mohawk Elder, Tom Porter (Sakikwenio’nkwas) is the founder, director and spiritual leader of this Community. The purpose of this Community of Mohawks is to revitalize Native languages and traditions and to educate Native and non-Native people about the true history, culture, language and spirituality of the Haudenosaunee (Iroquois) People. Native American Indian people are not "past history", but are quite alive today and have much to share. 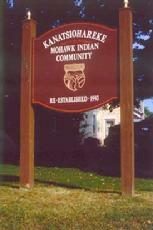 You can find more about the Community and the various programs that are offered by going to www.mohawkcommunity.com I have a copy of Tom Porter’s book Kanatsioshareke that I am circulating in the Church that tells the story of this Place and much more. Watch in the Dining Room for a soon to be appearing bulletin board about Kanatsiohareke. Native American Indians have great reverence for the land, the place where they are. I get that feeling in our Church Building – the place where we are – there is sacredness in our little corner of Bridge and Jefferson in Phoenix, NY. I felt that same feeling while at Kanatshiohareke – a sacredness of place. Our Church Community is also sacred, and there was that same spirit at Kanatshiohareke. We are planning on returning there within the near future. They have programs on many subjects where you can learn to make a drum or a basket and you hear some good teaching about life. Doug and I encourage you to consider going there. If you are also interested, let’s talk. Our Church is a place of Great Spirit. Kanatsiohareke is a place of Great Spirit. The People of our Church are most welcoming. The People of Kanatsihareke are most welcoming. When People of the Great Spirit gather together they are one, and great things happen. "We have now arrived at the place where we end our words. Of all the things we have named, it was not our intention to leave anything out. If something was forgotten, we leave it to each individual to send such greetings and thanks in their own way." Please click on "News and Events" for more scheduled activities. Our thanks, gratefulness, and love to all who traveled near and far to join us on October 19, 2013, to share and listen to a talk on "Iroquois Culture" given by Sakokwenionkwas (Tom Porter). It was a good turnout and by all accounts, it was a great success. 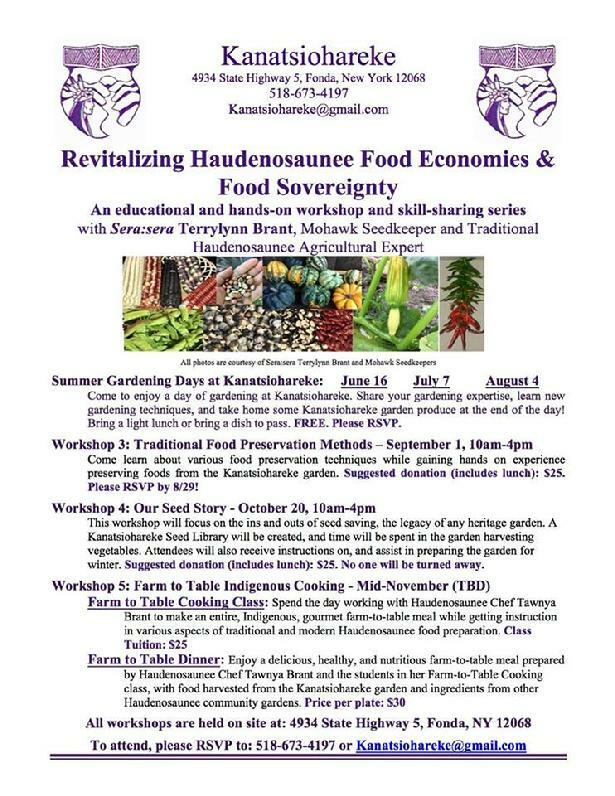 We hope that you all had a good time while learning about Haudenosaunee culture and traditions, and we hope you will be able to join us again for future events here at Kanatsiohareke. Our greetings, love and many thanks to the dedicated volunteers who helped to make the 2013 Kanatsiohareke Strawberry Festival a success! In spite of the inclement weather and an unforseen train derailment nearby, we welcomed many, many people who look forward to this event each year and managed to make it again. We are truly thankful that you all made it here and we look forward to seeing you all next year. Our greetings, love, and thanks to Bob & Maddie Vetter, & Nick Martinelli for your efforts in organizing a fundraiser at the Huntington Cinema Arts Center, in Huntington, NY. The benefit opened with Tom Porter (Sakokwenionkwas) who delivered the Ohenton Kariwatekwen (Thanksgiving Address). Kay Olan (Ionataiewas), a masterful storyteller shared some traditional teaching stories, shortly followed by traditional singers Hennes Porter & Kenny Perkins who shared some social songs while traditional dancers shared the floor with our guests. Performances by Tiokasin Ghosthorse & Matou were outstanding, and the films were well received in a comfortable cinema atmosphere. Many people came away with a new awareness of the indigenous peoples in their midst. 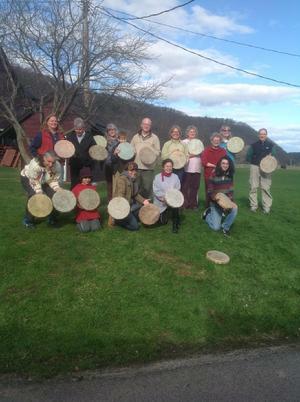 An experience in the culture and traditions of the Haudenosaunee (People of the Longhouse). Niawenkowa (Many Thanks) to you all for your generous efforts in support of the mission of Kanatsiohareke. The Benefit Concert at Caffe Lena on March 13, 2009, was a resounding success! We owe it all to our friends at Caffe Lena for their generous donation of the venue, and to Roy "Poncho" Hurd and Kay Olan for all of their efforts with the prep work that went into putting on a great show. Roy "Poncho" Hurd performed some of his famous tunes and a hilarious story or two. Jesse Bruchac did a wonderful presentation on Wabanaki cultural traditions through story and song. Kay Olan shared a Haudenosaunee story handed down to her by Dave Fadden, & Tami Mitchell sang the "Mohawk Baby Song" which was written by Theresa "Bear" Fox, and sang a couple of Tom's favorites. The Akwesasne Women Singers did a beautiful job with several wonderful songs, and "Bear" what a voice! All in all, it was a fun time. Niawenkowa to you all for your love, friendship, and support of Kanatsiohareke! About ten years ago a group of Aborigines from Australia visited the traditional Mohawk community of Kanatsiohareke. New York filmmakers Suzanne Jasper and Karl Shurman captured this unique meeting of the two cultures and created a charming 43 minute video. Many of us agree that it is the best footage ever done of an event at the community. The two groups � Australian Aborigines and Mohawks - share their traditional music and dance, as well as their cultural perspectives with each other. Both groups are committed to learning and living their traditions. For some, this commitment has helped them overcome the negative impact of residential school systems. 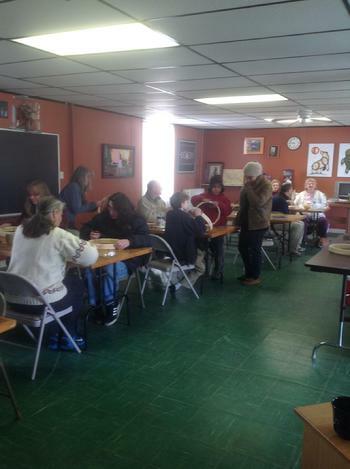 For others, it has strengthened their recovery from substance abuse. Walking a more traditional path helps them survive emotionally, physically, mentally and spiritually in this modern world. As the Australians dance in their traditional body paint, their movements evoke strong images of the animals from their continent. Later, Mohawks and Aborigines participate together in a Mohawk social. Although the dancing of each group differs greatly, the issues that they face in their lives have much in common. Sharing both their dance and their common challenges helps them form a powerful bond across the continents. Kanatsiohareke Newsletter 2009 Our new publication features a year in review, upcoming events, and much more!